Antonia Campus, Brief notes on Sraffa’s reappraisal of the Surplus Approach. 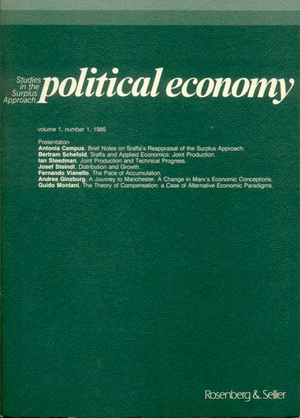 Bertram Schefold, Sraffa and Applied Economics: Joint Production. Ian Steedman, Joint Production and Technical Progress. Josef Steindl, Distribution and Growth. Fernando Vianello, The Pace of Accumulation. Andrea Ginzburg, A Journey to Manchester. A Change in Marx’s Economic Conceptions. Guido Montani, The Theory of Compensation: a Case of Alternative Economic Paradigms.